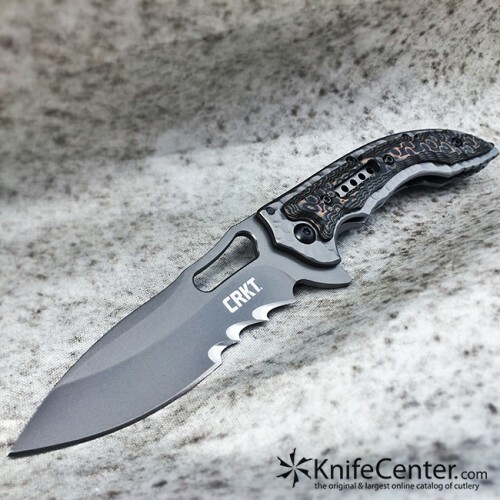 The CRKT Fossil: Don’t tell your pet dinosaur. This week we’re looking at a prehistoric blade with new-age features and stylings: this is the Fossil by Columbia River Knife & Tool. This particular knife is actually the compact version of the full-sized Fossil. Both feature the same Flavio Ikoma design, with the full-size version offering a slightly beefed up handle and blade. The gray combo blade has a hollow grind and drop point shape with Veff serrations and is made from 8Cr13MoV steel. There is also a satin finish version of both models. It’s deployed via the flipper feature or the thumb-hole cutout. The handle is made from hammered stainless steel with a G10 overlay on either side and a frame-lock design. There’s also a pocket clip for tip-up carry. The sheer number of features don’t detract from the overall hand feel, however. The balance of style and comfort is really the Fossil’s greatest strength. The IKBS ball bearing system allows for silky smooth deployment and the knife opens and closes confidently with the frame-lock design. Overall, the CRKT Fossil excels in style without skimping on functionality, a winning combination for any every-day folder. See more about the Fossil here, and check out our complete inventory at KnifeCenter.com! Also see the full video review of the Fossil here. I cannot emphasize enough how big of a sucker I am for Damascus steel knives. The look is second to none. That is especially the case with this Böker 67 Wild’s 250 layer “Boomerang” pattern by Chad Nichols. Just stunning. The knife is a special edition of Jens Ansø’s popular design and features a unique carbon fiber handle that ditches the typical geometric look for something more “Wild.” The clip and titanium framelock are satin-finished. 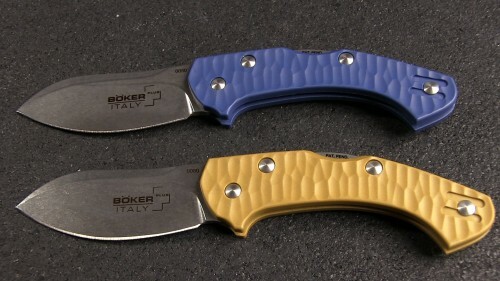 Handmade in the Boker factory in Solingen and strictly limited to 100 pieces worldwide. Check it out, for sure. 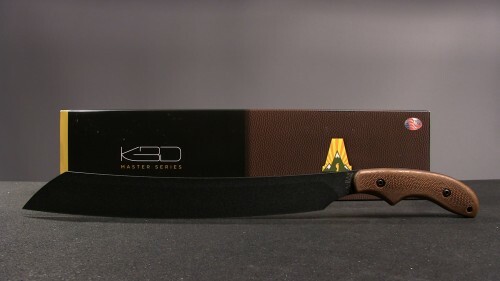 See this product and much more on our main site, KnifeCenter.com! 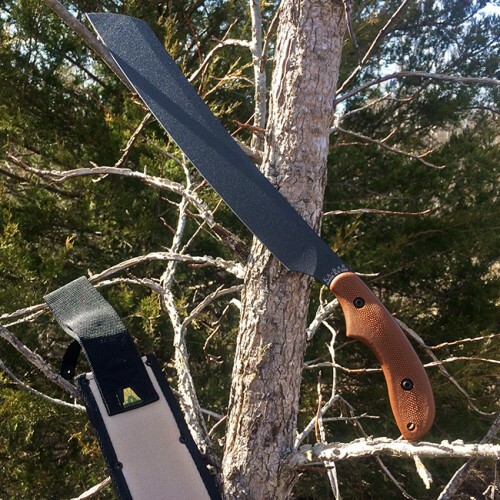 This machete is part of the KA-BAR/Johnson Adventure line-up of knives. Built in the parang-style, the blade makes for a great choice for more intense chopping tasks, as the style was originally developed to deal with the woodier vegetation of South East Asia. Great balance and slim looks helps make the Parangatang a sure winner. The Adventuregrip handle is made up of two textured Zytel scales, which provide great grip and hand feel. The length of the handle also allows for a couple of different grips depending on your current task. Weighing in at just less than 21 ounces, the Parangatang feels nicely balanced and should make for a comfortable item to carry and utilize in the field. I really like how the slim blade doesn’t compromise mobility with unnecessary broadness. It also comes with a MOLLE compatible Cordura sheath and is made in the United States. 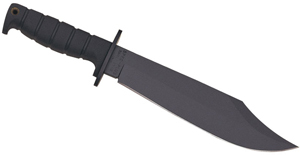 Overall, the KA-BAR Parangatang is an impressively balanced offering. It should make an ideal companion out in the field. 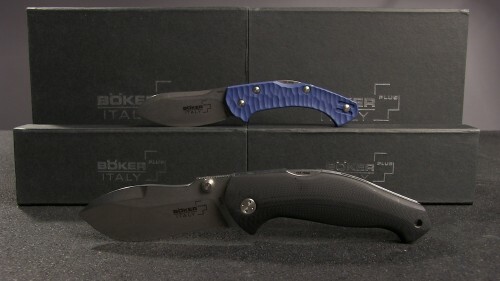 See this and more of our extensive inventory at KnifeCenter.com! 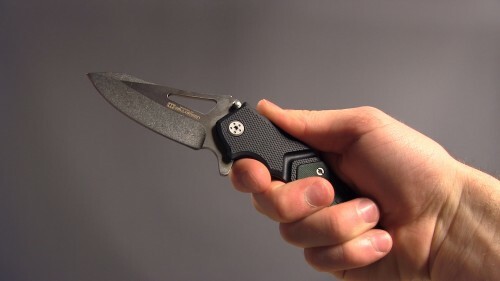 The ZT 0180 is one mean Hinderer-inspired field knife. Based on Rick Hinderer’s Fieldtac knife, the new Zero Tolerance 0180 is a smaller and lighter fixed-blade knife, yet it’s built to handle tough duty. Add to that its mean and minimal look, and we’ve got a definite winner on our hands. The blade is made of Vanadis 4 Extra powder mettalurgical cold work steel. 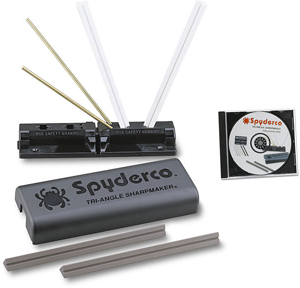 This steel is perfectly designed for hard use and offers good wear resistance. Its natural resistance to chipping and cracking makes it an excellent steel for hard-use applications like the 0180. It is also very suitable for coating—which ZT does with tungsten DLC non-reflective coating. 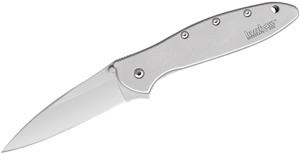 The 0180’s handle scales are G-10 for durability as well as reduced weight. The handle fits really well in the palm and balanced weight feels great. Heavy jimping on the spine further enhances grip. 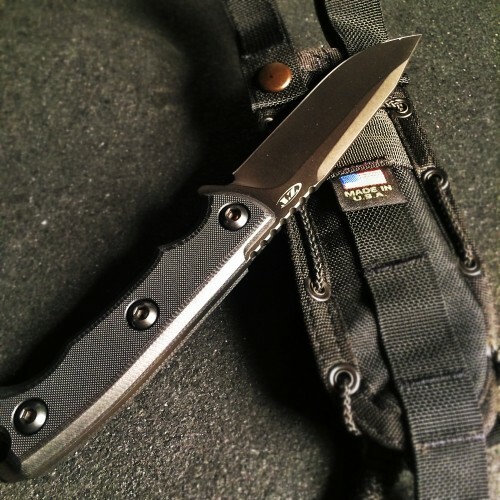 A tactical nylon belt sheath comes with the blade. Both are made in the USA. 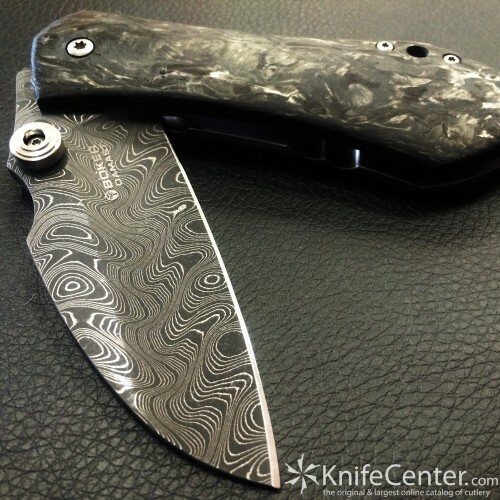 See more of this knife here, or check out our entire selection Knifecenter.com! The Mojo and Zero: Two truly international blades. 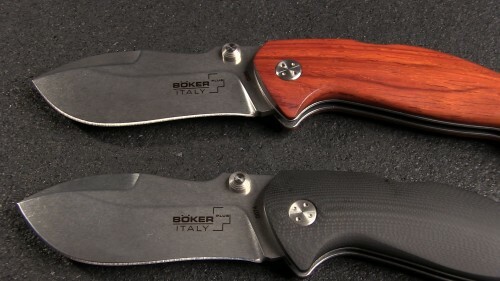 In this week’s Spotlight Series, we’re looking at a pair of affordable and well-crafted Italian-made EDCs: This is the Boker Plus Mojo and the Boker Plus Zero. Designed by Danish knifemaker Jen Anso, the Mojo and the Zero are part of new series of premium Boker Plus products made completely in Italy through their partners at Fox Knives. The Zero’s three-inch stonewashed blade is made from N690 stainless steel with a drop point shape. The spine is meaty enough to grip easily, which is good because there are not thumb studs or other features to speak of. It’s an attractive design that really flows and curves well from blade to handle. The lock-back design feels a little like anachronism these days between the sheer number of liner locks and side locks on the market, but it’s no less effective or sturdy of an option, especially for everyday use. 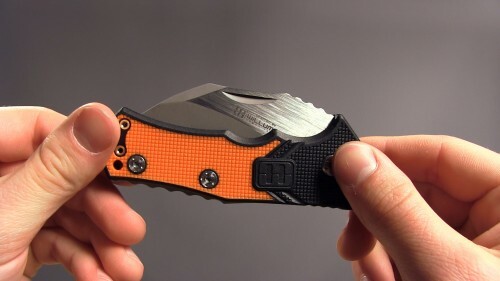 The handle itself is made from textured FRN scales in a very, very slim design, which results in a incredibly compact knife that weighs under two ounces. It has a comfortable hand-feel, though it might get lost in larger hands. It also comes with a reversible pocket clip for tip up carry. The Mojo, on the other hand, flaunts its larger size with a handle that really fills the palm well. It comes in either a G10 scale or cocobolo wood version with the same lock-back design as the Zero. No pocket clip on this model, though it does come with a lanyard loop and a leather Boker Plus belt case. The blade is the same corrosion-resistant N690 as the Zero, but with a great deal more belly, dual thumbstuds and a bit of jimping on the spine. Very unique, very cool looking. Overall, the Boker Plus Mojo and Zero is provide knife fans with great options at accessible prices, which is a important factor in today’s increasingly-expensive Every-day carry market. 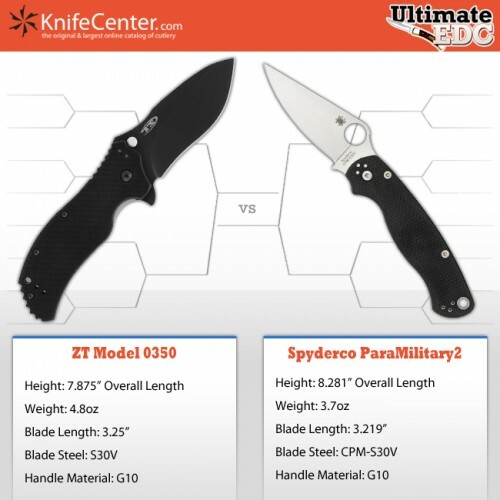 Thanks for checking out KnifeCenter’s Spotlight Series. Check back every Tuesday for a new entry. Well, we’ve reached the end. After a long week of close match-ups, tough decisions, and righteous indignation, we finally have our champion. 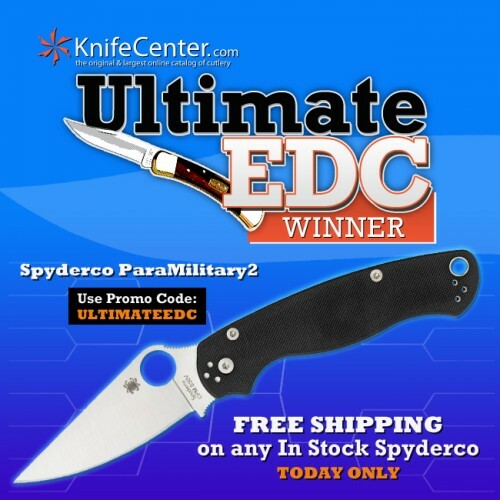 Congrats to the ParaMilitary2 and its supporters for taking KnifeCenter.com’s first annual Ultimate EDC title. The Pm2’s closest match-up was actually in the very first round against a well-loved and well-rounded Zero Tolerance 0350. Both had a great chance to win it all, but they suffered the ill-fortune of being faced against one another in a loaded division. In the end the Pm2 squeaked out the win by a slim 53-47 margin. This was the big one. No other knife had a bigger obstacle to get out of the quarterfinals than the Pm2. The Small Sebenza is a beast of a blade with almost unanimous approval and it posed a huge threat even at a less-than-accessible price tier. But voters pleasantly surprised us by weighing price and practicality just as heavily as materials and reputation, which I had hoped would be the enduring spirit of the Ultimate EDC competition. No contest here. The Pm2 obliterated Grandpa’s beloved Buck 110 with nearly 90% of the vote; a victory that showcased both the building momentum behind the Pm2’s tournament as well as a possible flaw in the bracket structure: it’s hard to imagine ANY of the rather-chaoticly chosen Wild Card competitors defeating the Over $100 Division. I was so happy that the final match-up turned out the way it did. Not because the voting was particularly close – the Pm2 won by a decisive 65-35 margin – but because the final two competitors really did exemplify the spirit of a true EDC: they were both reasonably priced with quality materials and boast an army of every day users. Many knife lovers own one or the other. Some own both. At the end of the day either is a great choice, and it was fun to watch them face off. Thanks to everybody who participated in this year’s tournament. I really enjoyed running this campaign, and I hope we can bring it back in a bigger and better form next year. Until then, stay sharp everyone! Thanks so much for participating in KnifeCenter’s Ultimate EDC tournament. 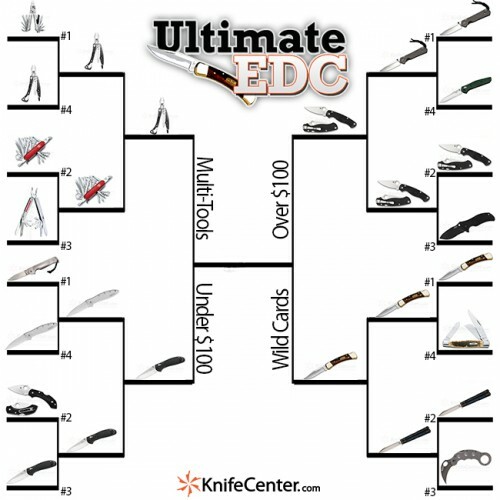 Keep an eye out for the final results on Monday, March 23rd, where we declare your EDC Champion! The Story So Far: UPSET ALERT! The king is dead! No offense to Chris Reeve fans, of course. 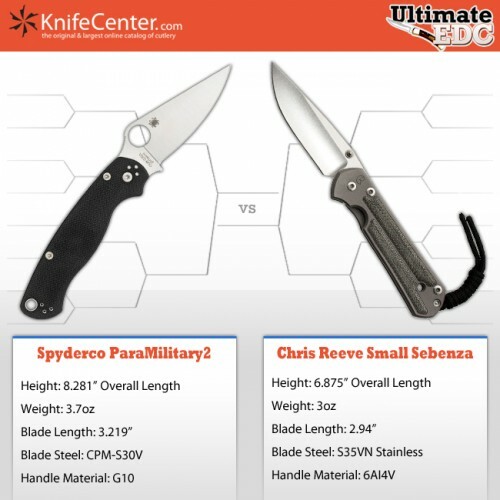 The Small Sebenza was a beast and the #1 overall seed going into the tournament, but it couldn’t overcome the groundswell of support for Spyderco’s ParaMilitary2 and lost by a substantial 63-37 margin. 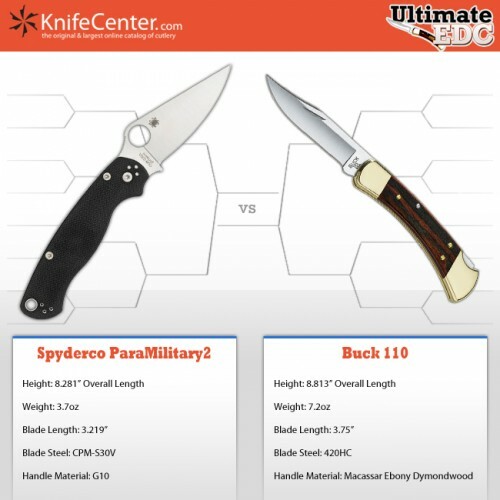 Can the PM2 keep up the momentum against a surprisingly frisky Buck 110 out of the Wild Card Division? 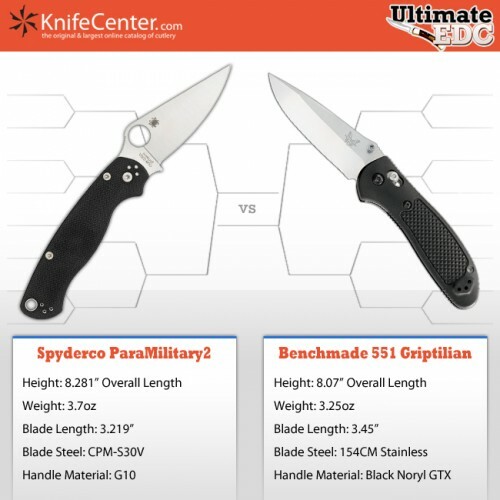 Meanwhile, the Skeletool and the Benchmade Griptilian were busy obliterating their competition on the other side of the bracket with nearly 80% of the vote. The two face off today in the semis; I’m excited to see who comes out on top. The Story So Far: Tough match-ups all around: both multi-tool winners barely squeaked by their brethren by a matter of votes; even the Mighty Sebenza had a bit of a scare, defeating the Benchmade 940 by a 54-46 split. 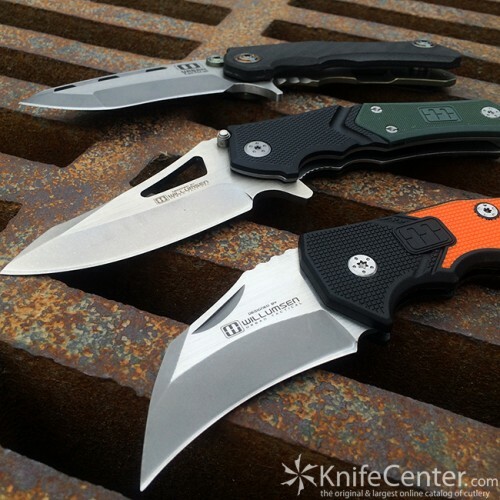 Biggest upset goes to the #4 seed Kershaw Leek, which toppled the #1 Cold Steel Bushman with nearly 70% of the votes. (How far can the little guy go?). My office pool pick, the ParaMilitary2, is still alive and kicking, but does it have the support to take out the expensive and exceptional Sebenza? We’ll soon find out.